The most difficult question to answer while planning for early retirement is- How much money I need to retire early? We have spent a fair amount of time thinking about the most optimal early retirement corpus number. In the end we figured out the most straight- forward approach is to equate the retirement corpus to (X) times your annual expense. (X) being number of years of expenses you want to save. 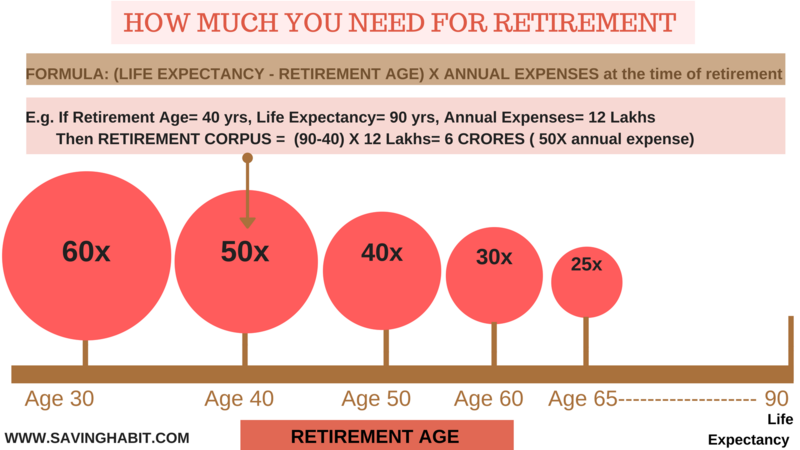 In this post we will help you estimate how much money you need to retire early in India. This is a rough guideline that we have used to calculate our own early retirement corpus. How much money I need to retire early In India? In this approach the corpus you need is : 1. Your INFLATION adjusted annual expenses (MULTIPLIED BY) No: of years of expenses you want to save. Take your current annual expenses and adjust it for inflation depending on when you want to retire early. For Eg: If you are age 30 and have annual expense of 12 lakhs, and plan to retire by age 45, assuming inflation rate of 6% you will need 28 lakhs in future value. Retirement Age: 45: years to retire 45-30= 15 year. This is the most debated subject in the Early retirement community: How many years of expenses must be saved before hanging up your boots? Conundrum is you save too less, you will exhaust your retirement corpus before you die. To save fattest corpus possible- you need to work much longer. How to find the right amount to live happily on after you retire? A blogger named Mr.MoneyMustache (MMM) is a rockstar in the F.I.R.E community for having confidently declared himself retired early at age 30 in year 2005 to raise their young baby. 13 years later he is about 43 years old now. That is a lifetime in the F.I.R.E community and hence he is a role-model for Early Retirement. He recommends an early retirement corpus of 25 times your annual expenses at the time of retirement, also referred as 25X. Take your annual spending, and multiply it by somewhere between 20 and 50. That’s your retirement number. If you use the number 25, you’re implicitly using a 4% Safe Withdrawal Rate, which is my own personal favorite number. So where does this magic number come from? At the most basic level, you can think of it like this: imagine you have your ‘stash of retirement savings invested in stocks or other assets. They pay dividends and appreciate in price at a total rate of 7% per year, before inflation. Inflation eats 3% on average, leaving you with 4% to spend reliably, forever. MMM’s theory of 25X for Early Retirement is based on the Trinity Research Study for traditional retirement spanning a maximum of 30 years. Early Retirement enthusiasts claim that if you can live on an above-inflation return of 4% from your 25X retirement portfolio, your corpus will last forever. Not sure if 4% withdrawal rate right for? Read our blog post Safe Withdrawal Rate- How long will your money last in retirement. It is essential to understand how 4% safe withdrawal works. So we recommend you read the above post. There was once a naive time in the past when we believed this simplistic math because we desperately did not want to work in unhappy jobs ever again. The Trinity Research Study quoted by the F.I.R.E community is a study done for traditional retirement. It shows that a retirement corpus will last for 30 years with a 4% safe withdrawal rate even if there are market downturns. But we are not aware of any such study done for Early Retirement which by definition lasts for more than 30 years throwing a big question mark on whether 25X alone is enough to retire early and live off for say 40-50 years. High inflation in India eats up most of the investment returns. Even headline inflation is 6% so our lifestyle inflation must be much higher. Unforeseen old-age healthcare expenses and inflation in health insurance premium. As a result of the above reasons, we’ve changed our attitude towards this math, work and early retirement in general. It is better not to have a corpus that is “just enough for living expenses” dependent on unpredictable market returns. We now believe that a safest approach is to target a corpus of annual expenses (times) the number of years you expect to live after early retirement. Assuming zero real returns i.e. investment returns just meet the inflation. Sooner you want to retire- more no: of years you will live on your retirement corpus and bigger it needs to be. If you are rigid about not wanting to work again then go with the exact number you get after above calculations. But, If you are flexible and willing to do some part time work to cover some part of your expenses you can quit job with much less corpus. keep reading to know how. 25X corpus is better suited for a traditional retirement around age 65 because 25 years of expenses works out to a life expectancy of age 90, the age till which most people expect to live. Don’t worry if a corpus of 50X or 6 Crore by age 40 seems like a really large number! If you are like us and want to use early retirement to make a career shift, start a business or even travel the world we recommend a more practical plan. Age 30-45: Target 25X within 10-15 years to become financially independent first. This is very much achievable with a savings rate of 50%. Start early in your 20s if you can. Age 45-50: With 25X of expenses as the safety net, you can afford to quit your job and figure out how to make money from your real interests in life. A new venture can take 3-4 years of focus before it starts covering your living expenses. Age 50-65: Once your new venture succeeds, invest any surplus to grow the 25X to give yourself a really secure old-age retirement. You have another 15 years to grow the 25X into say 40-50X. This approach allows you to pursue your passion early in life using a reasonable safety net of savings. If the thought of “working” after Early Retirement puts you off, I recommend re-reading the section above on inflation in India that convinced us that working on something we like from a position of strength is better than running out of money and being forced to work from a position of weakness. So yes! we recommend 25X corpus as the Early Retirement Target. but not to live off of it for the rest of your life. but to use it as a safety net for a few years when you make the leap into the unknown. Most F.I.R.E aspirants don’t seem to recognise that their Life is passing them by as they try to build the largest corpus possible before quitting jobs they don’t like. The downside of trying to save 50X in 10-15 years is that you have to earn a lot of money sacrificing your prime youth in the process. That is the opportunity cost of trying to build a huge “war chest” before taking even the first step towards your dream life. To put it bluntly : If you don’t feel confident with 25X you may not feel confident even with 50X. We are grateful to Mr.MoneyMustache for helping us understand that Early Retirement is possible with the help of reasonable savings, can-do attitude and some active income after retirement. But his passionate followers make the mistake of assuming that his 25X corpus recommendation is the “maximum” corpus needed. When in fact it is the “minimum” needed to balance the opportunity cost of living the life you want versus slogging till age 60. … you don’t have to be insanely conservative, working for year after year to ensure a gigantic starting nest egg before daring to retire. …Once you quit a full-time job, you just need a small positive savings rate to stick around and keep trickling into investments. This will automatically become a cash snowball as you go about your daily retired life. By the time you’re old enough to need it, it will be bigger than you can possibly need. We hope this post helped you to come up with your own early retirement corpus target that works best for your lifestyle and future plans. Please feel free to ask us your questions in comments. Also, we would love to hear in comments what is your early retirement corpus target and why. Great to hear that you started! Good Luck. If you have not read our blog post on safe-withdrawal rate- https://savinghabit.com/how-long-will-your-money-last-in-retirement/. we recommend that you do, it is a great post. I am retiring in 2023. 4 more years .I have a corpus of around 2.5 cr today in shares and MFs. will generate around corpus of 2 cr by 2023 at retirement . So total of 5 cr. monthly expenses is 1 lac. I will get pension of 50,000 a month. wanted to know if 5 cr at 2023 is sufficient for me to retire. Dr Anita, Thank you for writing to us. Please give us a couple more days to get back to you. Thanks! You can reach us through Contact Us page on our blog. Great goals!!! wishing you all the best! Good strategy to keep retirement corpus separate from other one time expenses. Great that you are planning for such expenses separately! We also have a independent goal for child education, we will share more on it in one of our blogposts. We may or may not save for their marriage:-) anyways we think in India we spent way too much on weddings and would encourage the kid to go for simpler and less expensive alternatives or to pay for it themselves. We are assuming 12% return in the accumulation phase. But 0% real rate of return post traditional retirement. we are only expecting our investments to beat inflation. It is conservative- but we feel since our asset allocation would be debt + Equity + rental from real Estate. debt + real estate will pull down our returns. We still have to fine tune our post retirement withdrawal strategy. I haven’t firmed up my post retirement strategy either but isn’t even 0% real rate of return agressive given the drawdown you should be assuming. With a 4% draw every year, you’ll need inflation + 4% to keep your corpus intact. Or did you mean that the whole portfolio will yield at par with inflation and with your drawdown will steadily shrink? That sounds more fair. I know us ‘FIRE-ers’ like to obsess over this kind of stuff but I’m not going to give it too much thought till I’m a couple of years away from the I-day. Seems too much like tempting the Gods to start counting the chickens. O% real rate of return means 0% return after inflation. So you are correct: we are assuming that our portfolio returns will match inflation but will shrink with every withdrawal. Theoretically if we save 25 years of expenses, with 0% real rate of return our corpus will meet inflation adjusted expenses but will exhaust by the end of 25th year. We have our doubts about the 4% Safe withdrawal rule. I’ll be writing about it in another blog post. Hopefully we will share it sometime next month. we wish we had 100 years of data like USA to support our safe withdrawal rate assumption. Just to clarify that 4% rule means that in the first year of the retirement you withdraw 4% from your retirement corpus but in the subsequent years withdrawal is not 4% of your corpus but the inflation adjusted amount you withdrew in the previous year. The logic being that your portfolio will grow and shrink based on the returns but your spending cannot always go down. Since you need a minimum amount to live on, in some years when the returns are low and your portfolio falls in value, counter-intuitively you will withdraw more % to meet your fixed expenses. However you can withdraw 4% of your corpus every year, but it is not same as 4% rule. That is a very important distinction. With 4% fixed withdrawal rate, the corpus may last longer but when your corpus falls in value that 4% will not be enough to cover your expenses. We are also figuring out a viable withdrawal strategy post retirement. It is the second part of the equation and equally important. Our future posts may give a more holistic view on our withdrawal strategy. 3. Down payment for home but delaying it as much as I can given buy versus rent not making any sense towards buying . I do believe 25x is enough how ever I will exclude travel, one time expenses like kid wedding/ education totally out of it. One of the yardstick I have pushed myself to think 50 is by asking my self, how many 50 years old I see in my company . No I am not expecting 12%. I am expecting 10% . Better to be conservative so that more can be saved. What’s important is understanding asset allocation. I understand you have assumed the kitty to grow till 65 but you are also taking sequential risk. I will perhaps take half the corpus at age 57 and put in liquid funds and let rest of money grow. The convincing at home I am trying to pursue is not buy home till 50 and rather buy then at a city we may want to retire. It should lead to 65% equity by January 2020.